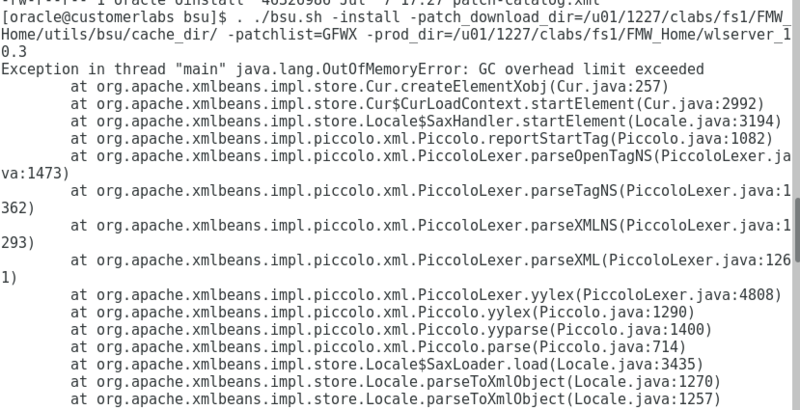 If you are trying to Apply any Big Patch, while Checking for conflicts…., “BSU” might end-up with Java Heap Errors. To Avoid, Try to Increase the size in $FMW_Home/utils/bsu . Edit bsu.sh using any editor as below. Change the Value MEM_ARGS=”-Xms256m -Xmx512m” to MEM_ARGS=”-Xms1024m -Xmx1024m” or even bigger and save. This will resolve the above issue and re-try applying the patch .